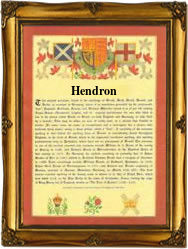 Recorded as Hendren and in Ulster, Northern Ireland, as Hendron, this is apparently an English surname, although one claimed by some researchers to be of Norman-French origins, and even to be a form of the mainly Scottish Henderson. This may be so although we have not been able to provide any definate proof either way. It may also be locational, but if so we have not been able to positively identify any place in the known surname spellings or indeed anything near to it, unless it be the North London suburb and former village of Hendon. So it is also possible that the name originates from a now "lost" medieval village, as it is known that at least three thousand surnames do derive from this source, but again we have drawn a blank. The name is first recorded in the the surviving registers of the diocese of Greater London in the mid 18th century when Ann Hendren married Richard Bowyer at the church of St Katherine's by the Tower (of London) on December 5th 1745, whilst another Ann Hendren married Christian Ahrens at St Anne's Soho, Westminster, on November 16th 1770. The records of the infamous Irish Potato Famine of 1846 - 1848 also show that an Edward Hendron aged twenty three, left Liverpool on the ship "Columbia" bound for New York on November 19th 1846.